This is actually just an unfinished doodle (not a completed illustration) from Yagüe, who works as a professional concept artist at Ubisoft Toronto. You may be familiar with some of his work from Splinter Cell, Assassin’s Creed III: Liberation, and Assassin’s Creed Unity. You can see his more finished pieces, both professional and personal, on his website, ArtStation, and deviantART. If you’d like to develop some concept art skills of your own, Yagüe has a handful of tutorials up on Gumroad. Check them out! 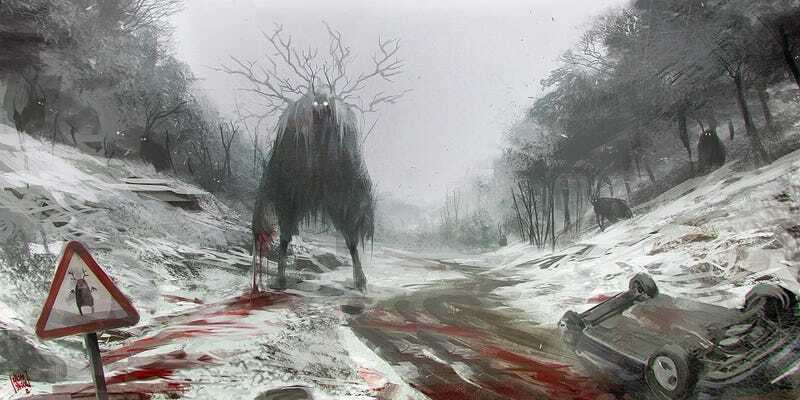 “We Should Take the Other Road” is featured with the artist’s permission and was spotted on r/ImaginaryHorrors.